25% of sixty-five year old women in the United States are diagnosed with osteoporosis. For a person technically to qualify for this label, it means she has lost 50- 75% of the original bone material from her skeleton. 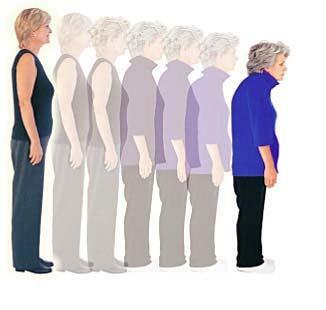 That is 1 out of every 4 women of sixty-five years old has lost over half her bone density! Today, more deaths are caused by osteoporosis than cancer of the breast and cervix combined. Unfortunately, the loss of calcium and other minerals from the bones is a gradual process which goes on steadily for a long time before it becomes evident. There is no flashing red light to warn us that our bodies are losing calcium. And it is usually not apparent until loose teeth, receding gums, or a fractured hip show how brittle and chalky the bones have become. The end result of the skeletal structure’s gradual erosion is calcium-deficient bones that may break with the slightest provocation. Even a mere sneeze may crack a rib. One of the reasons the decreasing bone density is hard to detect until it reaches such as unfortunate stage, is that even in extreme cases of osteoporosis, the calcium level of the blood is usually normal. In the body’s ranking of needs, the blood level of calcium takes definite priority over the bone level of calcium. The body needs calcium for vital operations, such as controlling muscular contractions, blood clotting, transmission of nerve impulses and other utterly essential tasks. When the body needs to supply calcium to the blood for any reason, it acts as if the bones were a ‘bank’ of stored calcium, and through a series of biochemical reactions a ‘check’ is drawn on the calcium bank. Your body draws calcium from your bones to supply calcium to your blood. I used to believe that bones lost calcium only if there was not enough calcium in our diets. The National Dairy Council is the foremost spokesman for this point of view, and the solution they propose, not all that surprisingly, is for us all to drink more milk and eat more dairy products. In fact, the dairy industry has of late spent a great deal of money promoting this point of view; and it does seem logical. But modern nutritional research clearly indicates a major flaw in this perspective. Osteoporosis is, in fact, a disease caused by a number of things, the most important of which is excess dietary animal protein! The correspondence between excess animal protein intake and bone resorption is direct and consistent. Even with very high calcium intakes, the more excess animal protein in the diet the greater the incidence of negative calcium balance, and the greater the loss of calcium from the bones. One long-term study found that with as little as 75 grams of daily protein (less than three-quarters of what the average meat-eating American consumes) more calcium is lost in the urine than is absorbed by the body from the diet – resulting in a negative calcium balance. This is true even if the dietary calcium intake is as high as 1400 milligrams per day, far higher than the standard American diet. Throughout the world, the incidence of osteoporosis correlates directly with animal protein intake. The greater the intake of protein, the more common and more severe will be the osteoporosis. In fact, world health statistics show that osteoporosis is most common in exactly those countries where dairy products are consumed in the largest quantities – the United States, Finland, Sweden and the United Kingdom. African Bantu women take in only 350 mg. of calcium per day. They bear nine children during their lifetime and breast feed them for two years. They never have calcium deficiency, seldom break a bone, rarely lose a tooth… How can they do that on 350 mg. of calcium a day when the (National Dairy Council) recommendation is 1200 mg.? It’s very simple. They’re on a low-protein diet that does not kick the calcium out of the body’. At the other end of the scale from the Bantus are the native Eskimos. If osteoporosis were a calcium deficiency disease it would be unheard of among these people. They have the highest dietary calcium intake of any people in the world – more than 2000 mg. a day from fish bones. Their diet is also the very highest in the world in protein – 250 to 400 grams a day. The native Eskimo people have one of the very highest rates of osteoporosis in the world. Keeping our blood at an essentially neutral pH is top priority for our body. If our blood were to become too acidic we would die. Accordingly, if the diet contains a lot of acid forming foods (meat, dairy, sugar and processed carbohydrates), then the body, in its wisdom, withdraws calcium from the bones and uses this alkaline mineral to balance the pH of the blood. Meat, eggs and fish are the most acid-forming of the foods, and hence the ones that cause calcium to be drawn from the bones to restore the pH balance. Most fruits and vegetables, on the other hand, generally yield an alkaline ash, and so require no depletion of calcium stores from the bones to maintain the neutrality of the blood. In spite of its high calcium content, milk, due to its high protein content, and high acidity, appears actually to contribute to the accelerating development of osteoporosis. The occurrence of this disease in the United States has reached truly epidemic proportions, and the promotion of dairy products as an ‘answer’ to the suffering of millions seems, not only self-serving, but absolutely immoral and downright dishonest. Source: Excerpt taken from Robbins, J 1987, Diet for a new America. HJ Kramer & New World Library, California. We all live a very busy life style and thank goodness we have Juice Plus because most of us don’t get the recommended fruits and veggies. Send questions about Juice Plus to Jan Naylor-Smith at janjuiceplus@gmail.com . She is very knowledgeable and super friendly.